Sorry about the delay, guys! We’ve kinda had a seriously rough week. Lots of bad things happened that I won’t go into detail about. It’s okay though, don’t worry! We’re okay, and we’re going to keep you entertained! So while you guys are waiting on some legit Blaster Nation comics, we’re going to give you some little doodle comics! 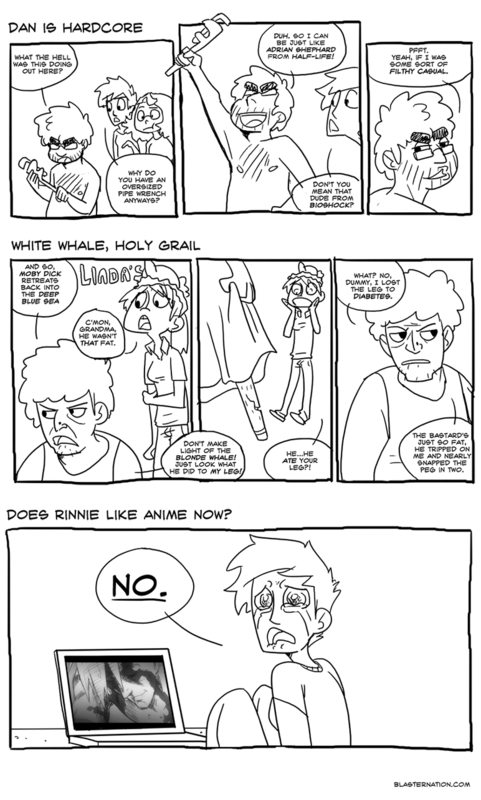 Just some short, simple comics poking fun at characters and plot points from this last chapter. Hopefully you enjoy them! If not those, then enjoy some fanart! Our good friend Vicky livestreamed himself doing some Blaster Nation doodles, which I took the liberty of compiling and putting in a single image for your viewing pleasure!ï¿½ A Deviantartist and fan by the name of LeenaLala also drew a pinup shot of the world’s sexiest man, Dan! Oh baby! Thanks to both of you, both pictures are up on our Bonus section. That’s all for tonight, though. Keep coming back, we’ll have more fun stuff for you later!